Dark gloomy clouds gather at the top of St. Paul’s Hill as we continued our way up through flights of stairs covered in maroon paint, onto a complex of museums, into the open road, a trellised path and at last, a final series of stairway leading to the ruins of St. Paul’s Church atop the hill. 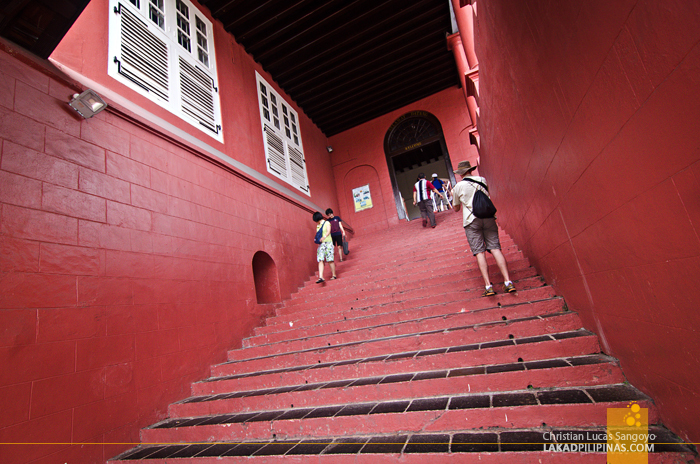 In theory, the climb is easy enough, but in reality, the intense suffocating heat of Melaka, even on overcast days, makes the climb double the effort. We decided to pass off this particular ruin during our first outing in the city almost exactly a year ago, but this time, with nowhere else to go, we prepped ourselves in braving the heat to finally see this famous ruin. 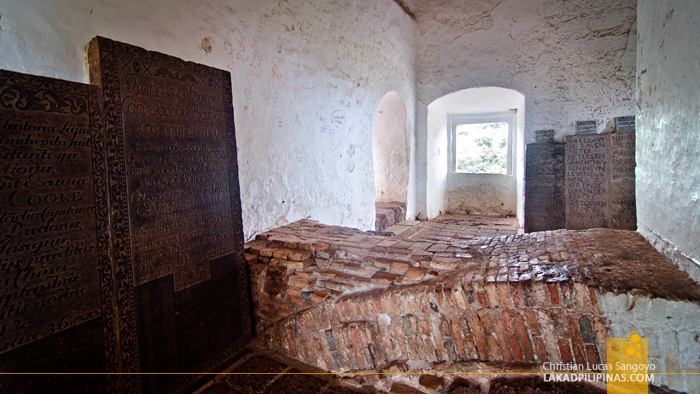 St. Paul’s Ruin is the oldest non-functioning church structure, not only in Malaysia, but in all of South East Asia. It is quite small, being originally built in 1521 by a certain Portuguese nobleman, Duarte Coelho, as a chapel rather than a full-blown church. 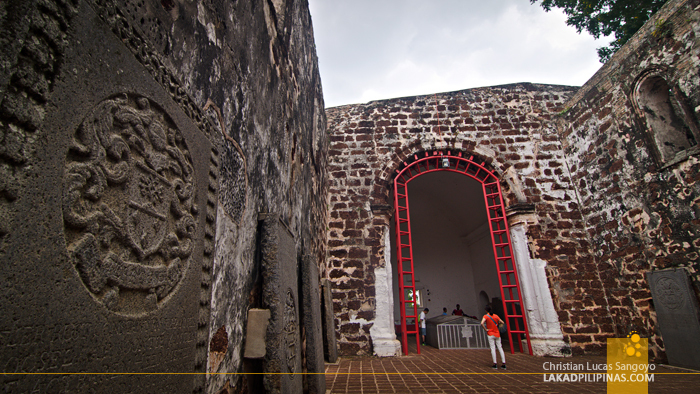 It was originally dedicated to the Virgin Mary with the title Nossa Senhora da Annunciada (Our Lady of the Hill) before it was renamed as the Igreja de Madre de Deus (Church of the Mother of God) in 1590 along with the addition of a second floor a few years before and a bell tower. 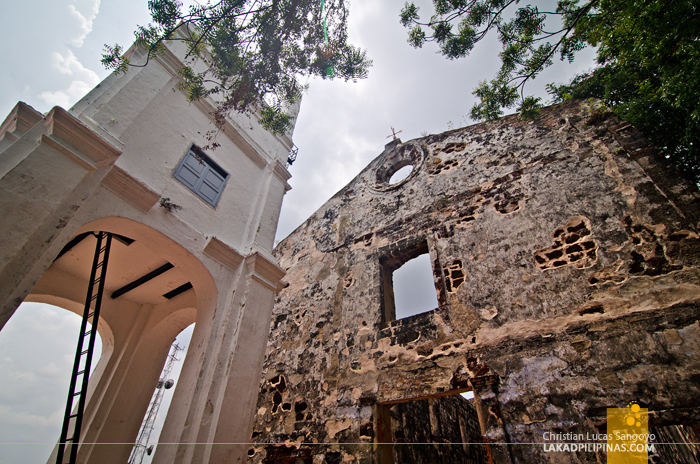 At the moment, the church now lay in ruins, without roof, doors nor windows. 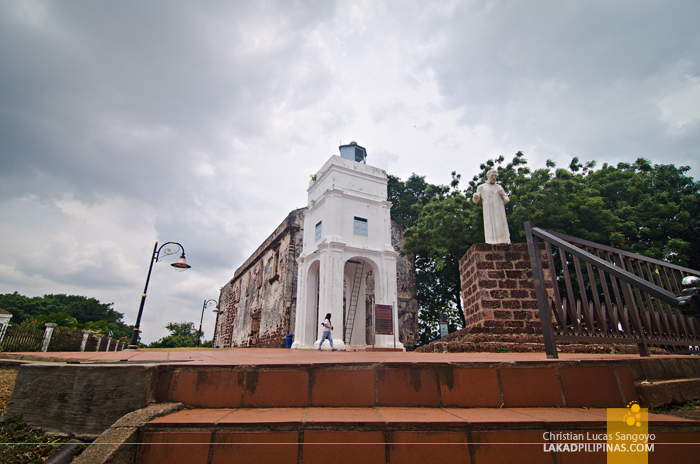 Only the belfry, which stood separately a meter or so from its mother structure, is intact and painted in white. 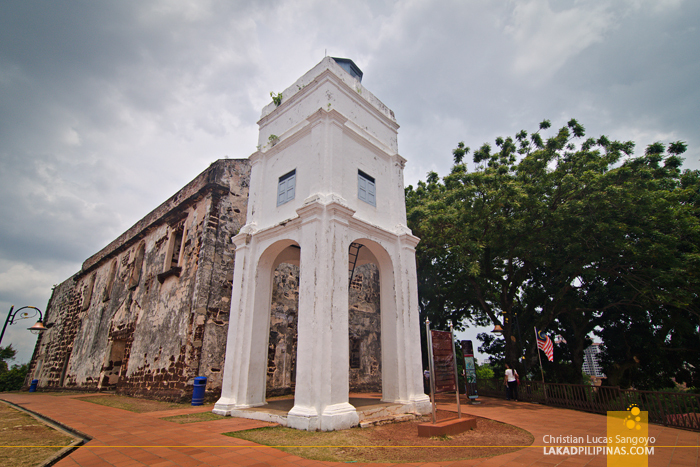 A direct result of the building of the now more famous Christ Church at the Melaka Dutch Square, found at bottom of the hill, and further disuse during the British invasion of Melaka in 1824. What struck me when exploring the interiors of the church were the numerous gravestones leaning on the thick walls of St. Paul’s. 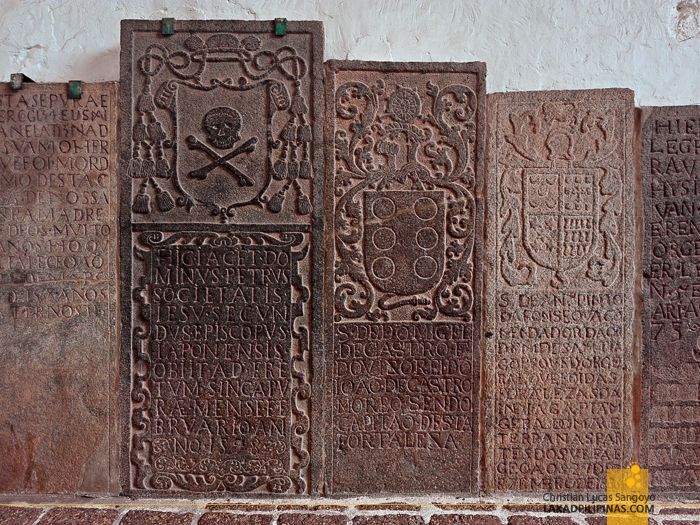 These aren’t your usual tombstones, but rather larger than life slabs of rock, more than a few standing higher than me, carved and engraved with skulls, crossbones, coat of arms and a language foreign to my eye. Each one was as impressive as the next and I later learned that these were from famous people back in the day. 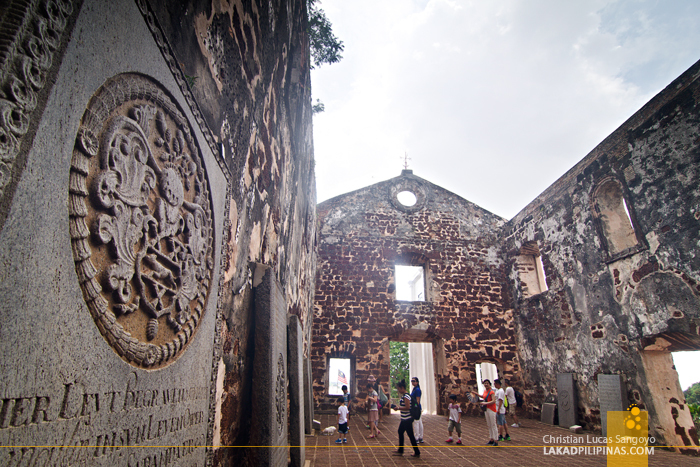 More than the ruins, which is still part of the UNESCO World Heritage stamp on the city of Melaka, the massive gravestones were the ones that really made its mark on me during our visit to St. Paul’s Church; very much worth the t-shirt drenching climb up the hill. Although I have never been to Malaysia, it has been on my mind that it is a Muslim country and that churches like this won't be visible. But looking at the pictures, they must have more of majestic churches like this. Very beautiful indeed!